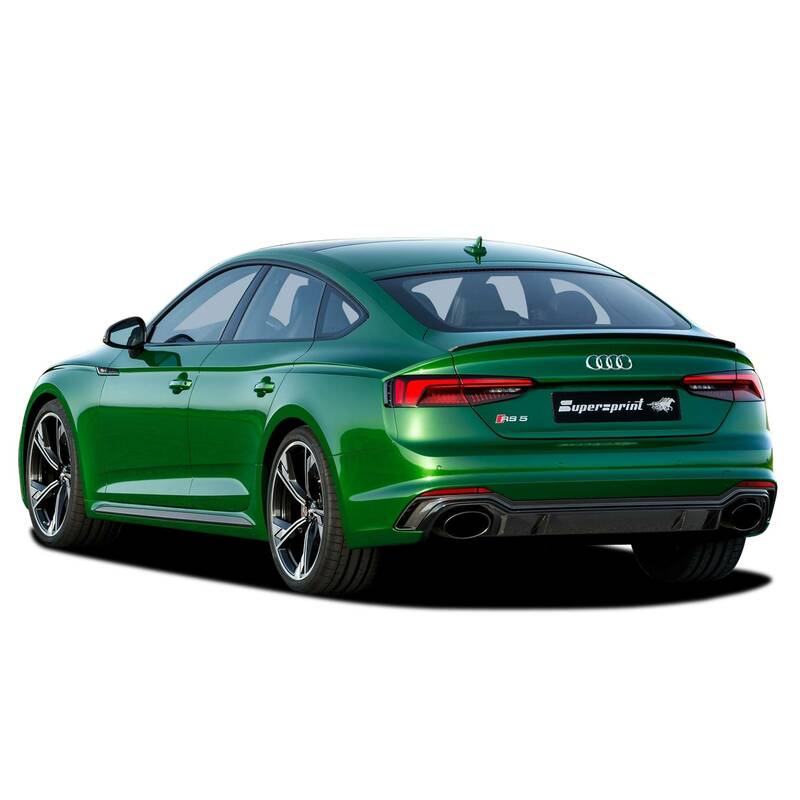 Supersprint proudly introduces the new cat-back exhaust for the 2018 AUDI RS5 and RS4 Twin Turbo V6. An initial, limited-quantity production batch already has started being handcrafted by our crew, here at the Supersprint manufacturing plant in Mantova, Italy. We are currently taking pre-orders, offering special discount deals to the faster-reacting RS4/RS5 owners. The Supersprint mid section, available in two distinct versions (straight-piped, or resonated), has been developed with the goal of greatly reducing the resistence of the stock unit, which is rather small in diameter and crushed down in several places, unfortunately. Our 90mm diameter, oversized single tube provides for a much larger cross-section, and ensures a massive decrease in the resistence to the exhaust gas flow. Since our next plan on the RS4 / RS5 is the development of Turbo downpipes, with high flowing, HJS Motorsport cats, we have sized our exhaust for a capacity of 600+ Hp, 800+ Nm. A SW tune, in conjunction with the Supersprint full exhaust, will instantly transform the new, RS4/ RS5 B9 into a RS6 / RS7 beater. However, the tighter confines of the smaller displacement engine, and the more compact chassis of the RS4 / RS5 makes this plan become a more challenging task. Now that all has finally been done, we are proud to say that our R&D crew did an excellent job. layout of the Supersprint system is a no-compromise, ideal design, and the fitment is just perfect at the same time. Our guys have paid special attention to guarantee ample clearance in the most critical area, nearby the rear Sport differential. Technically speaking, we have opted for a single pipe design over the more logical, dual pipes, because of the lack of space. Squeezing dual pipes in these tight confines would have required using very tiny diameter pipes, resulting in an overall smaller, final cross section; certainly not adequate to our 600+ Hp goal.  In particular, the Supersprint single-exhaust 90mm constant-diameter pipe (without any crushed-down sections) is routed to retain the stock, reiforcement bars of the chassis with ample clearance, leaving both of them in their same, original position. 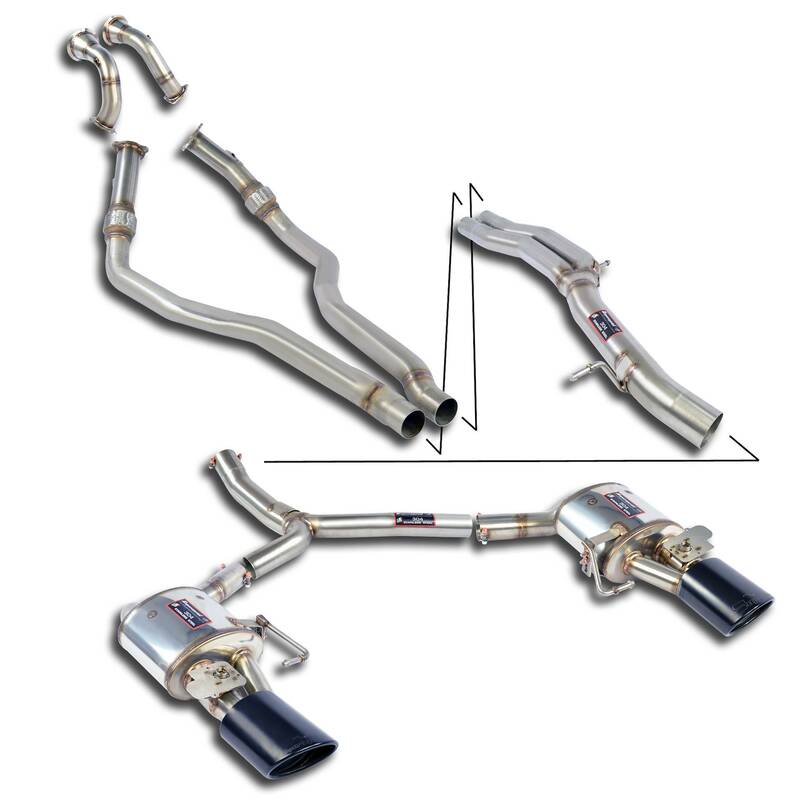 This ideal, perfect exhaust design ensures that the fitment is done easily, and that the final, installed position of the entire Supersprint system requires no modification. Placed shortly downstream of the mid-section, the Supersprint Y-split pipe, R&L rear muffler system features an extremely effective, dual-sound mode design. The difference in sound between the closed (quiet) and the open (loud) mode is extreme. The Supersprint mufflers use our own, proprietary mechanical flaps, which are operated by the stock Audi electric servo motors, retaining the same switching mode active under all of the manual, or pre-set Driving options. We have developed these new flaps in house, designing them from the ground up, and we currently machine all of their individual components, from the throttle-style bodies to the shafts, out ouf premium quality, italian steel alloy, here at our own CNC machine shop in Mantova. The SS rear mufflers install very easily, exactly like the stock exhaust; the available tail pipe otions are Silver chrome, or Black chrome. Prices to be posted and more news to come, as our R&D on the remaining exhaust sections progresses (R&L Turbo downpipes and HJS Motorsport catalytics).